Ramya grew up in populous Chennai city in south India where she did her Bachelor’s (S.D.N.B. Vaishnav College for Women) and Master’s (Madras Christian College) in Chemistry. After her graduation in 2006, She took up a research scientist position in a consumer care company before moving to North Dakota State University for her doctoral studies in 2011. 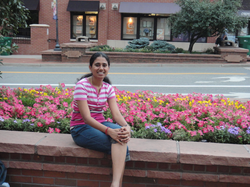 She focused on the investigation of stereospecific photochemical transformations of atropisomeric chromophores and photodegradation of oligomers/polymers derived from renewable resources under the mentorship of Prof. Jayaraman Sivaguru and Prof. Mukund P. Sibi. After her graduation in 2016, she moved to Columbia University to work with Prof. Luis Campos group where she will be working on functional polyelectrolytes for various applications. Apart from research, she loves cooking, gardening and playing with pets especially puppies.